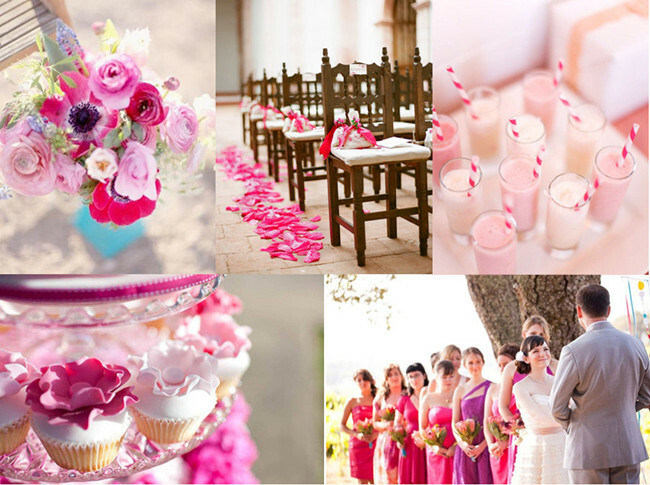 You are in charge of planning the bridal shower. The couple is planning a casual wedding in a sunny spot and you decide on a beach themed bridal shower for the festivities. This type of shower will be fun and easy to plan. You may not be able to get to the beach but with some simple planning and decorating, you can bring the beach to you. 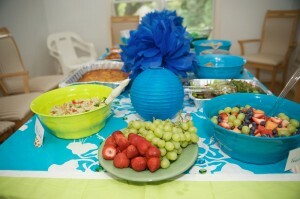 From invitations to food, you can enjoy a beach themed party for the bride. Think fun, sun, warm sand, and have a blast. 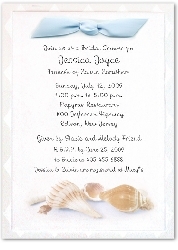 You can find cute bridal shower invitations that have beach themes. You can also make them with your computer and printer. When sending the invitations make sure to let them know the shower has a beach theme. Include information on attire; they can dress for the beach in sun dresses or shorts and tanks. Gift information can also be included on invitations if the couple is registered or if gifts are to be beach themed. Decorating for a beach themed party is fun. If your location is indoors, you can bring the beach inside. Hosting the shower at a location with a pool is an option, as in your home. You can use cardboard cutouts of surfboards. Fill some inflatable baby pools with sand; add the surfboards along with sand buckets and shovels. Palm trees, white twinkling lights, and seashells are wonderful decorations as well. Beach towels and nets hung with shells in them add to the theme. Favors for bridal showers with beach themes can be fun. You can find bottle openers in shapes including starfish and flip-flops. 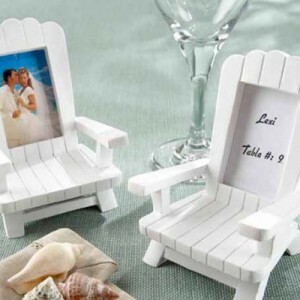 Photo frames with seashell designs or designed as beach chairs make wonderful favors for guests. Cookie cutters, hand fans, votive candles, and luggage tags are also great shower favors. Music in the background is a great way to set the mood for your beach themed party. Any Beach Boys music or Jimmy Buffett brings thoughts of sandy beaches to mind. Reggae music is another option for background shower music. A movie playing quietly is another way to bring the beach theme to your party. 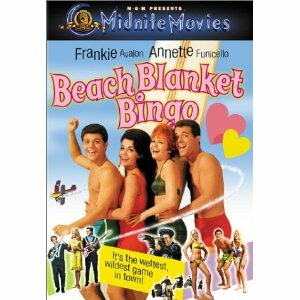 Elvis had beach movies or the older beach movies with Frankie and Annette would make great background movies. Serving drinks with fruit flavors will keep with the beach theme of your shower. 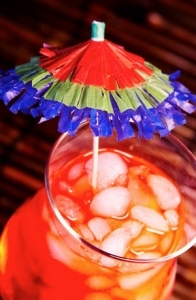 Use umbrellas in the drinks for a tropical look. You can add slices of fruit to the punch. Whether you serve alcoholic and nonalcoholic drinks, you can have fruit in them. Coconut flavored drinks are a great beach drink as are classics like the Pina Colada or Daiquiri. You can keep the food simple with your beach themed shower. Pulled pork sandwiches, shrimp, and fresh fruit go well with the beach theme. Fresh sliced pineapple and light pasta salads are good choices. Cookies in shapes of starfish, seahorses, shells, or flip-flops are great additions. Marshmallows dipped in chocolate and coconut are another option. Games are a fun part of any bridal shower. With a beach themed party, you can really have fun. 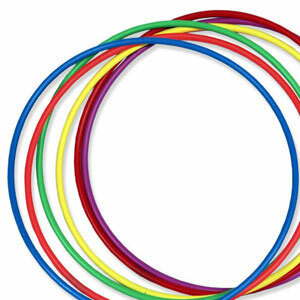 Have a hula hoop contest and name the song using beach songs. Limbo contests can be fun games to play as well. You can improvise the traditional ‘making the brides dress from toilet paper’ into making a bikini for her instead. Remember to divide into teams and take turns. Unscrambling words related to beach and wedding items can be a lot of fun. You can have a trivia contest of who knows the bride best using questions. WIth just a little bit of planning, your guests will have a blast with the beach games. Games are not complete unless you have prizes for the winners. Some simple prizes include flip-flops or a small bag with suntan lotion and a few other beach related items. 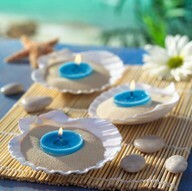 Candles with shells on them or photo frames decorated with seashells make nice prizes. 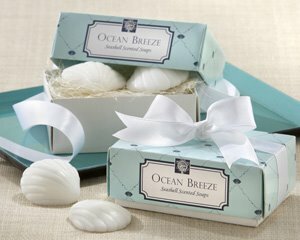 Soaps shaped as seashells and beach themed glass coasters can also be used as prizes. Because your shower theme is more casual, you can choose a simple bridal shower cake. Keeping with your beach theme there are several cake options. A sheet cake or round cake frosted in a light brown to beige as sand will work nicely. You can add a few decorations to the top of the cake. Use doll chairs, Barbie sunglasses, a super ball for a beach ball, fruit roll ups, which you have cut, as beach towels, and you have a beach setting for your cake top. Alternatively, the top can be as simple as drawing a heart in the sand frosting and putting the couple’s names in the heart, like drawing in the sand. Another option for shower cakes is the elaborate cake. For a beach themed bridal shower, you can use a beautifully airbrushed beach themed cake. You can have the cake made into a beach with the ocean and the air brushing with look amazing. 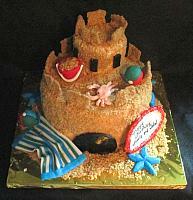 A sandcastle cake would be a huge success at a shower with a beach theme. Even a casual shower can have an elaborate cake, so choose whatever you think the bride will like the most for her bridal shower.